This post is going to take a look at Yamaha guitars by shape. This will only include their acoustic and acoustic-electric guitars (does not include their Classical and Electric guitars). The chart below shows the differences in the sizes. Sizes of different models may vary to the table below. Total Length 41 3/16 40 29/32” 41 5/8" 40 3/16” 40 1/4" 34 1/8"
Body Length 20 5/32” 19 7/8” 20 1/8" 19 9/16” 19 5/16" 15 3/16"
Lower Bout Width 16 1/3” 16 1/4” 15 3/4" 14 15/16” 15 1/8" 11 13/16"
Body depth 4 15/16” 4 5/8” 4 1/2" 4 3/4” 3 9/16" 2 15/16"
O.k. let’s take a look at the guitars offered in each different size/shape. As with most guitar manufacturers there are a good number of options for Yamaha dreadnoughts. FG180-50TH Spruce Mahogany No No 50TH Anniversary. All Solid Wood. LL36 ARE Engelmann Spruce Indian Rosewood No Passive Vintage looks - constructed using higher level luthiers ? One of the unique features of this shape is that it features an oval soundhole. 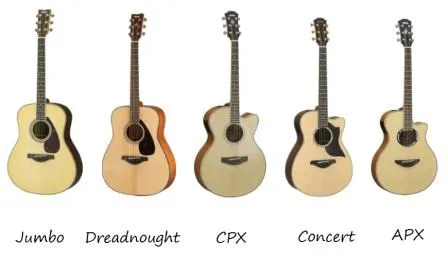 I hope this has given you some perspective on Yamaha’s acoustic guitar lineup and their different sizes/shapes. If I’ve missed any guitars above, please feel free to leave a comment in the comments section below.